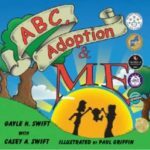 In our two previous blogs, we focused on the role of the family adoption library as a way to facilitate important yet perhaps difficult conversations about adoption complexity. Books are one of many tools parents can draw upon to help them. The most salient point in these blogs was this: Hold the conversations and have them with enough frequency that everyone becomes comfortable with the topic. And this is the "gold nugget" in his post: on the inside, he'd been struggling for years. Struggling to understand his ambivalent feelings, struggling to parse his gains and losses, struggling to protect his parents from his worry, struggling to fulfill his "obligation" not to upset them because it could be perceived as ungrateful. That's a lot for a youngster to handle without support. It is tragic that the parents whom he describes as loving him deeply have somehow missed the opportunity to walk with him through his struggles. 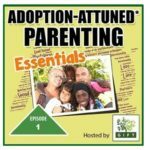 It would appear that they have not succeeded in creating that open atmosphere of trusts, acceptance, and empathy that would reassure their son that they are capable of hearing not everything is perfect regarding his adoption. 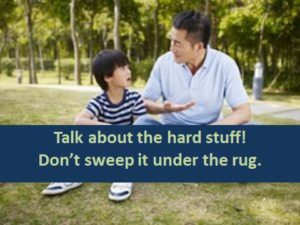 Intentional parents create a safe & inviting space where difficult topics can be discussed. This level of communication provides a safety net so kids don't believe they must hide or deny their thoughts and feelings or that they must struggle without parental support & guidance. What have you done in your own family to build this sense of conversational security and openness with your children? What else might you do to further reassure them? How might you raise the issue of "withholding information" or "protecting parents from hard truths" directly? 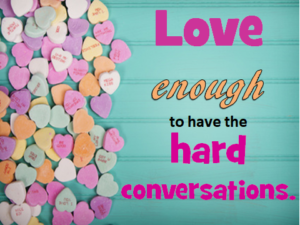 How would your family benefit from this type of intentional conversation? Reweaving connection...so much of life depends on our ability to accomplish this. Families built via adoption live this reality in a unique life-redefining way! We understand the effort and importance involved. Whether a relationship breach exists between spouses (or significant others,) between/among friends or, among larger social groups like classrooms, offices, communities and countries, repair is an essential part of keeping relationships alive and healthy. Relationship repair takes work, requires accountability, cooperation and, commitment. It is challenging to admit we've messed up, fallen short or, failed. While not easy, it is worth it. The many horrific weather events that have confronted the world recently, remind us that working together smooths the pathway to rebuilding damage. It is impossible to do it alone. We need every skill set. Every contribution is valuable. None of us can sit back and do nothing. Each of us can contribute something. Sunday night in Las Vegas redefined ghastly. Evil. When moral and social values completely collapse--as in the case of this massacre--we reel with shock, despair, anger and helplessness. However, we must not succumb to these emotions. Yes, they have their place and time. We must move beyond the outrage and DO SOMETHING. Channel the anger and frustration into productive directions. Move beyond outrage. DO SOMETHING to create change. Channel the anger and frustration into productive directions. We all belong to the human family. Contemporary society focuses too much on difference, division, and viewing other people as obstacles to our goals and happiness. While practical steps are essential, we must recast the conversation of negativity, disrespect, hate and "othering." We must upend this destructive paradigm and embrace a world view built on respect, cooperation, empathy and common purpose. We must resist petty distractions and focus on doing what is right instead of what is easy or comfortable. How can we become part of the solutions? Sending donations and writing checks certainly helps, but we must do more. The adage "Think globally. Work locally." must guide us. Family is the most "local" place on which to focus our attention. Do an honest gut check about how well we are exemplifying and teaching our children our values. Then, expand our assessments into other layers of our lives: work/school, community, country, etc. Let us be brave enough to ask the hard questions and acknowledge the reality. This allows us to identify shortfalls or disappointments and then focus on creating the change we desire. Do I practice the "Golden Rule?" Do I speak and interact with respect? Do I welcome and absorb feedback without arguing why it is wrong? When I offer feedback, is it free of any hidden agenda or petty emotions? Do I encourage and acknowledge the efforts of others without tacking on criticism? Do I respect differing viewpoints? Do I listen to understand without formulating a rebuttal? When expressing my own viewpoints do I allow space for divergent positions? Can I disagree without making it a personal attack on the other person? Do I work to improve the inequities around me? Do I feed conversations that inspire and encourage? Do I disparage and complain, dismiss the struggles of others as their fault or not my concern? 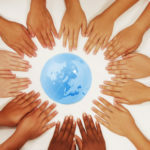 Do I look beyond overt differences to see the common humanity of others? Am I amplifying convesations that reinforce hate and anger? 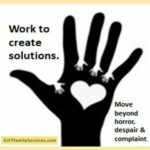 Am I advancing conversations that build solutions instead of simply venting anger? Americans have a cultural belief: Money Talks. What is yours saying? How strong is the connection between our spending and our values? What did your spending over the last two weeks say? First, the appearance of a disparity between expectation and reality is neither a good or bad thing. It is simply information. So, if your chart reveals this kind of gap, the next step is to identify what drove the financial decision. Was it a response to an immediate but unexpected financial priority to which you intentionally appropriated money? Or, was it an impulse expenditure. If the latter, dig deeper to identify what drove the choice: stress, hunger, time constraints, loneliness, pressure from family, friends or co-workers, community or world issues, etc. By identifying the reason, the leverage point for creating better decisions in the future becomes clear. 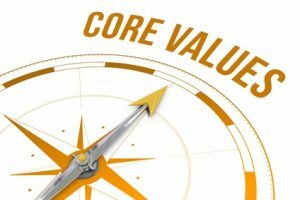 How well did it embody your Core Values? This can be a more challenging inference to accept. 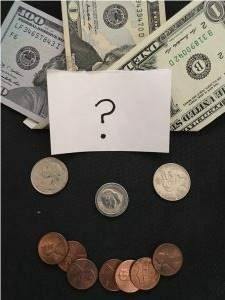 Has habit led us to spend money in a way that does not reflect our Core Values? Which spending choices revealed an abandonment or weakening of our values compass? Examine each choice separately. Get as clear a mental picture of the factors that occurred at the time you spent the money. List who was present. Recall your emotional state as well as any other details that you can. How did that group of factors make it easy to veer away from your values? When the chart indicated that an expenditure aligned well with your values, ask the same questions as above. This will help identify the thoughts, circumstances and systems that help keep you aligned with your values. What role did impulsivity play? Let's face it. Modern life is BUSY. We never seem to have sufficient time, energy or money. Sometimes it is easier to spend spontaneously without first calculating if it is prudent or not. Once we've noted the factors that led to spontaneous (un-Intentional) spending, we can use that awareness to decide with more Intention in the future. Revealing the specific influence opens the door to new strategies. For example, daily stops at Starbucks can add up quickly. 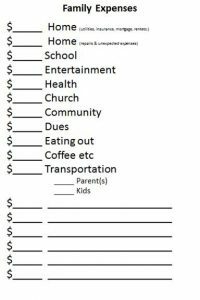 What is this expense accomplishing for you? Perhaps it a dash of needed self-indulgence. How else might that be accomplished in a less costly way that also aligns with your values? Or it might be a way of denying that money is tight because "It's only a few bucks" so of course it's okay. It could be a reflection of many possible factors, e.g. poor time management, unhealthy eating habits, hunger, or a behavior that is part of a group-identity. Whatever the reasons, they provide valuable insight. What opportunities for change did it highlight? To what extent did Intentionality govern your spending? Again, look at the factors and circumstances that supported your decision-making. Identify how you can create those factors more often. Note which relationships and circumstances support your values-based living as well as those which divert you. What can you do to moderate any negative influences in a way that honors your Core Values, yourself and your family? How can you avoid or limit the occasions that draw you off from your commitment to your values? What will be your first action step in response to this exercise ? How will it benefit your family? 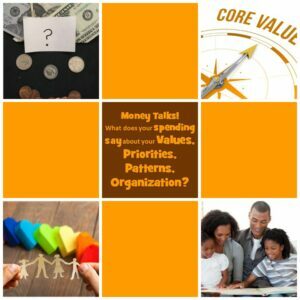 How will you involve the entire family in raising awareness of the connection between your Core Values and your spending habits?